Shirdi is well-known among devotees and tourists as the land of Shri Sai Baba. For devotees of Sai Baba Shirdi is a very sacred place. He lived in this region during the mid-nineteenth and early twentieth century, after which, this place became one of the famous pilgrimage centres of India. Today, a grand temple complex receives devotees coming from distant places to Shirdi. Shri Saibaba Sansthan Trust is an administrative body that handles temple affairs and it has also played a major role in the progress of this town. The Shirdi Sansthan has also taken several measures to make travel and accommodation easier for pilgrims and tourists. Ever since Shri Saibaba Sansthan Trust began its operations, it has been involved in numerous social causes. This has helped immensely in the development of Shirdi and improving lives of its people. Recently, it has started a new service called 'Mobile Clinic' with an aim to provide relief to people suffering from different ailments in and around Shirdi. This clinic operates with the help of an ambulance which is fully equipped with the essential medical facilities and can reach out to the patients residing in remote areas of Shirdi. It was a great success right from the day it began offering its services to the needy patients. On the very first day, this mobile clinic treated about 306 patients in different parts of Shirdi. Local residents are all praise for Shirdi Sansthan and have also expressed their gratitude for this great initiative taken by the trust. Both tourists and pilgrims are always in search for a decent place to stay, which would help them to enjoy their time in Shirdi. Those looking for a comfortable accommodation in Shirdi can book one at Hotel Sai Sahavas. This hotel has air-conditioned rooms, fully equipped with latest amenities. Greatest benefit of staying in this hotel is that it takes only five minutes of walk for its guests to reach the holy shrine of Shri Sai Baba. It also has replica of Sai Baba's shrine located on third floor, and guests would get a feeling of being in the actual Sai Baba temple complex. 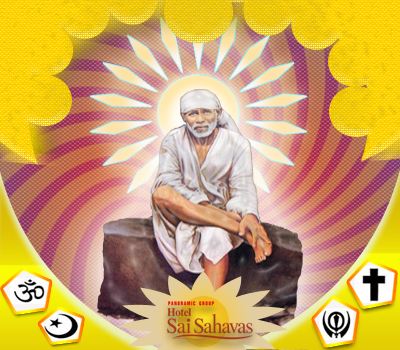 Sai Baba is regarded as a great saint and worshipped by people of all religions with utmost faith. There are many stories about this revered saint's origins, but the fact remains that Shirdi Sai Baba lived during the late nineteenth and early twentieth century. According to the events recorded in a book called Sai Satcharita, he arrived in Shirdi at the age of sixteen and led an ascetic life. He resided in an old mosque and received many Hindu and Muslim visitors. He maintained dhuni or sacred fire whose ashes he gave to devotees before they left the place. Spiritual teachings from Quran and sacred Hindu texts were also delivered by him to his visitors. He opposed orthodoxy and discrimination based on caste, creed and religion. While he led an ascetic life, he encouraged his followers to be with their families and lead a simple life. Sai Baba placed great importance on charity and giving equal respect to all beings. He also stressed on equality of all religions with his famous epigram, ‘Sabka Malik Ek’, which means, ‘One God governs all’. The Sai Baba Temple Complex is visited by numerous devotees who come from different locations. During festive season, the number of devotees can be expected to rise over a hundred thousand. This complex is spread over a vast area and is situated in the heart of Shirdi, fully equipped with facilities to manage the tremendous influx of devotees. Khandoba temple in this complex contains a small shrine with footwear or 'padukas' used by Sai Baba at its base. Another significant place in this complex is the 'Gurusthan', where Sai Baba spent most of his time during his early days in Shirdi. Samadhi Mandir housed in the temple complex contains this revered saint's tomb and is a place where Sai Baba arti is performed. An abode where Sai Baba remained till his end is Dwarkamayi Mosque, which is also situated within the complex. Other important places within the temple complex are Chavadi and Lendi Gardens. Devotees have great regard for Samadhi Mandir and Dwarkamayi mosque among other places inside the temple complex. According to legends, the Samadhi Mandir was owned by Shreemant Gopalrao, a millionaire from Nagpur. He wanted to keep an idol of Murlidhar in it, but the entire temple became Samadhi Mandir of Shri Sai Baba. Idol of this revered saint in this temple is made of marble and this temple's assembly hall has enough space for about 600 devotees. This temple opens at five in the morning with a song sung in praise of Sai Baba called 'Bhoopali', and closes at ten at night with the singing of 'Shejarati'. This temple is kept open twenty-four hours only on festive occasions of Gurupoornima, Dassera and Ramnavmi. Sai Baba had stayed in Dwarkamayi mosque till the end of his life, and this is the reason why it holds a special place in devotees' hearts. Pilgrims and tourists who wish to have comfortable accommodations during their visit to Shirdi can find Hotel Sai Sahavas an excellent place to enjoy a pleasant stay. It is just five minute walk away from the temple complex and is fully equipped with modern facilities. For those looking for budget hotels in Shirdi close to Sai Baba temple, this would be just the right place to stay.